Nations Press health WHITE RICE VS. BROWN RICE,WHICH IS BETTER?? ?-FIND OUT HERE! WHITE RICE VS. BROWN RICE,WHICH IS BETTER?? ?-FIND OUT HERE! June 14, 2010 -- Replacing white rice in your diet with brown rice may reduce the risk of developing type 2 diabetes, according to a new study. The finding is important because the consumption of white rice in the United States has increased dramatically in the past few decades, and about 18 million Americans have type 2 diabetes. Researchers at the Harvard School of Public Health say eating two or more servings of brown rice weekly seems to be associated with a lower risk of developing type 2 diabetes. On the other hand, they report, eating five or more servings of white rice per week is associated with an increased risk. 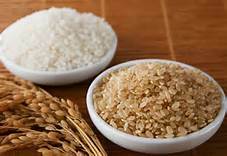 Qi Sun, MD, now an instructor of medicine at Brigham and Women’s Hospital in Boston, and colleagues at Harvard estimate that replacing 50 grams daily of white rice (uncooked, equivalent to a one-third serving) with the same amount of brown rice would lower the risk of type 2 diabetes by 16%. Replacing the same amount of white rice with other whole grains, such as barley and wheat, is associated with a 36% reduced risk. The study is published in the online journal Archives of Internal Medicine. The researchers say the study is the first to specifically examine white rice vs. brown rice in relation to development of type2 diabetes among Americans. White rice is created by removing the bran and germ portions of brown rice. The authors say that more than 70% of rice eaten in the U.S. is white.